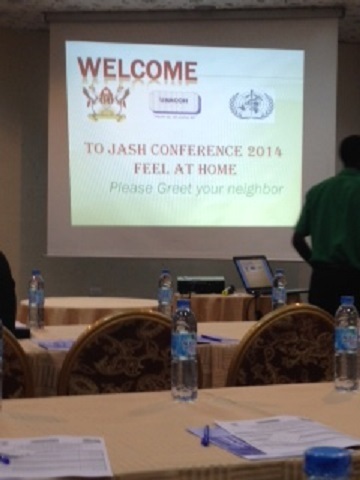 Picture from my seat at the JASH conference. One of the water bottles like the one in front of me was tossed across the room by the presenter. Attending global health conferences is always a great experience and as a student allows you to gain new insights into the field, hear interesting research discussions, and meet new people. There is always that one topic that sets the tone for the conference, and this conference was no different. Interestingly enough only after the second presentation of the first day the tone was already set. The topic was diseases of shame. Having looked over the day’s agenda I already had my own thoughts of how the day’s discussions would go. When I read there would be a talk about diseases of shame I was intrigued; furthered by the fact the talk was being given by the head of the research ethics committee at Makerere University. My initial thoughts were along the lines of sexual transmitted infections, other infections like leprosy and elephantitis, and severe disabilities. Many of you reading this likely have the same thoughts, as we have all sat through interesting talks about shame associated with these diseases. Right from the start of the discussion I had to throw out all my preconceived notions, as the presenter began the discussion in a very gregarious manner. One of his first sentences was, “I am going to take you on a journey and by the end I hope you all feel as ashamed as I do”. Immediately I was shocked at this notion but fascinated to see where things were going. He then continued and began to list what he would refer to as diseases of shame, none of which were the diseases that came to my mind. His list included: road traffic accidents, obesity, economic disparities between communities, maternal mortality, smoking, alcohol, diabetes, and heart disease. In turn he discussed each topic and the shame associated with the diseases. From his list it is clear to see that he was trying to get at a wholly different form of shame. The shame he spoke of wasn’t an individualistic type of shame of having a particular condition, but rather a collective shame that all Ugandans should feel towards the high prevalence and emergence of these conditions. Throughout his discussion he highlighted Uganda’s statistics for each disease and why Ugandans should feel shame about those statistics. His presentation was at times confrontational as he pointed out people in the audience for being overweight and at one point threw a bottle of water across the room to make a point about access to clean water. Although his presentation style may have gotten under some people’s skins, generally the audience walked away feeling some of the shame he had hoped people would feel. Following the discussion I couldn’t help but think how this same talk applied to the US. The most interesting fact being that the list of diseases of shame wouldn’t change that much. Also I thought to myself whether this idea of collective shame is a helpful way to look at things. It surely opened my own eyes at a novel way to look at disparities in health statistics, especially those that can be changed by behavioral and social modifications. As is apparent from the list most of these diseases are non-communicable diseases (NCDs) and NCD risk factors. Thus, the question I walked away with from this talk was: Is the high, and increasing, burden of NCDs and their associated risk factors something that countries/ the world should be ashamed of?